…not just because it’s fun to say. Bean frames have shot to the top of the ‘to do’ list. 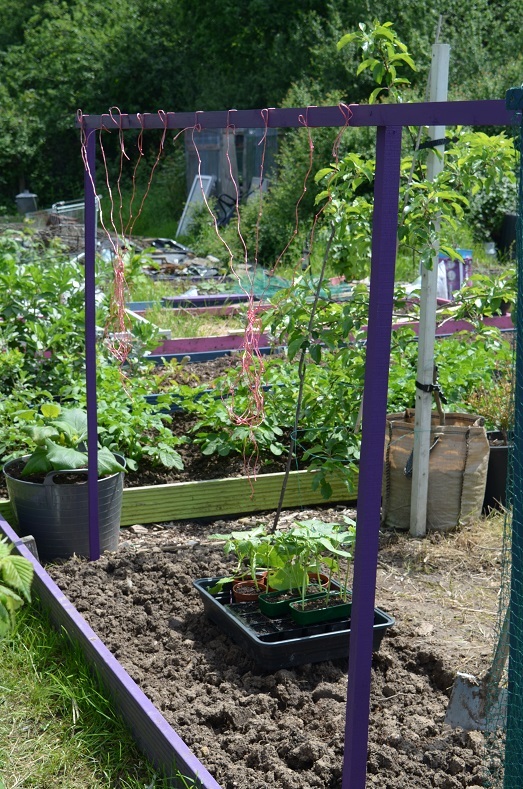 My favourite for maximising space and ease of bean picking has to be the Munty frame*. I have built the more traditional bamboo frames too, but, given I always try to cram in as many plants as possible on the plot, I resent losing perfectly good growing space underneath. 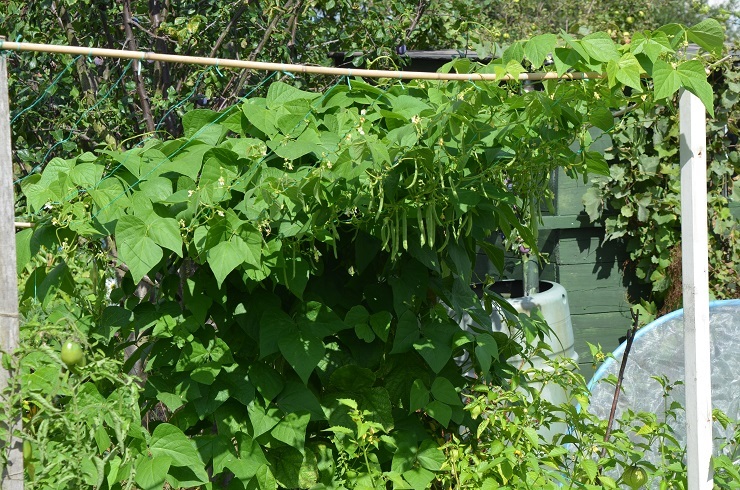 Shaped like a football goal, with a 4-5ft back frame and a 6-7ft south-facing front frame it allows the bean vines to grow 10ft long and the space underneath is still useable. As a bonus the higher front frame doesn’t have to go up till the beans have started to climb. I now have 3 of them – purple, white and blue, made out of treated battens & stakes. Two have been made to fit my 4ft-wide beds, but the purple one is 7ft wide and needs a small path underneath. They’re strung with knotted polytwine – it’s strong plus the knots will hopefully stop the vines sliding down on our windy site. As with the tomatoes in the greenhouse, the bean plants are sat on top of the end of the twine and their roots will hold it taut as they grow. Garden string would possibly give more purchase, but it rots quickly and would likely snap under the considerable weight of a Munty at Peak Bean. On that note too, last year I used bamboo canes on the back part of the frame – they just aren’t strong enough, certainly for the wider Munty. You can’t see it in the picture, but by the autumn it was bent into a U-shape and on the verge of snapping. 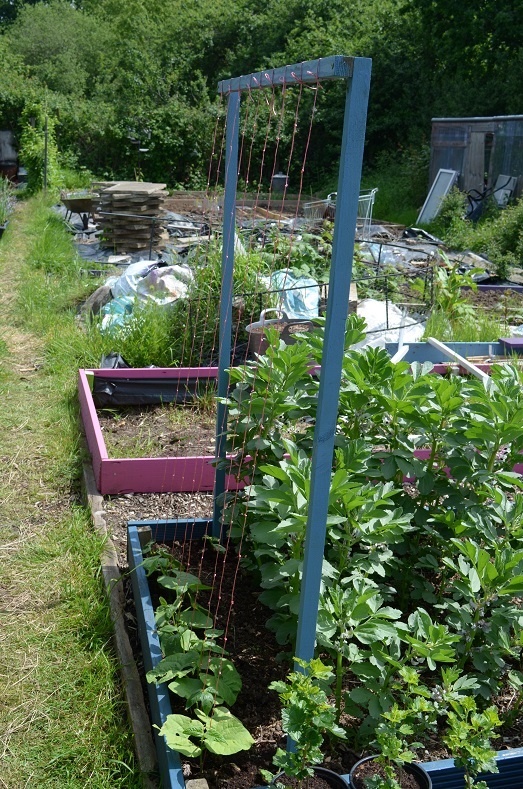 One thing to note – beans like eastern light, so that side (on my plot at least) is always the strongest growing. And I often have to educate the vines about staying on their own string and not wandering off to play on their neighbour’s! *it’s named after the guy who invented it, whose username was muntjac. Plus it is a great word! Interesting, I’d never heard of munty frames before. I’m also a fan of cramming in as much as possible so I’ll add this to my list of ideas for next year (wigwams are already up this year). I’m the only one to have them on my site so far, everyone else sticks with more traditional cane bean frames. They’re a bit more effort initially but I think they are worth it.